Gardenscapes is a game from Playrix, available on iOS, Android and Facebook. The game starts with the player inheriting a house from a relative, and with the help from the butler Austin the player has to make the ruined garden beautiful again. 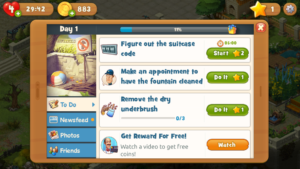 By playing match-3 puzzle games the player receives stars which can be used to restore some part in the garden, for example fix a broken fountain or plant flowers. While the player gets to higher levels, new parts of the garden is opened and ready to be fixed. During the game new characters and challenges are introduced to help the player to grow his/her garden. A screenshot of the garden. A screenshot of a puzzle-game. Besides the parts of the garden that is yet not fixed, the game is very colorful with a happy soundtrack and sound effects when the player achieves something or interacts with the environment. There is a big contrast between the dark, fallen garden and the color full and flourishing garden, which makes the player want to solve more puzzles to transform more parts of the garden. The game can be played on the users phone which makes it easily accessible for everyone who owns a smartphone, and can be played anywhere and at any time. The player can achieve stars by playing puzzle games. The puzzle games have different goals that need to be achieved within a specific time or with a limited number of moves. The goals can be achieved by moving and removing fruits and flowers. When there is a row of three, or more, of the same object, those objects are removed. The goal can for example be to find hidden gnomes or collect flowers/fruits of a specific kind. The player can also get different objects, like bombs or shovels, to help achieve the goal. When the player wins a puzzle-game he/she gets stars, which can be used to restore the garden, but if the player loses a game he/she loses a life. When the player has lost all lives, he/she can achieve new lives by waiting or get new lives from friends who also play the game. Austin, the butler, is one of the main characters of the game and gives the player new tasks to be performed. 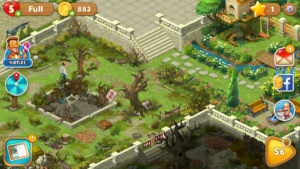 While the player gets to higher levels new characters are introduced, that can help restore the garden and new parts of the garden are opened. The story can only move forward and while the user can make some choices, for example what color the flowers should have, the story evolves in the same way, independently from the users moves. Every puzzle-game has a problem that the player needs to solve. By matching the same objects together the player can collect flowers or find hidden objects beneath. The problem needs to be solved within a specific time range or with a specific number of moves. There are often many possible moves for the player to make and all moves effect the game in different ways, and gives new possible moves. In the beginning the puzzles are very easy but as you get to higher levels the puzzles get harder and new goals are introduced. This makes the player interested in continue to play and keeps him/her challenged. 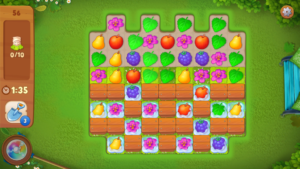 This is used in the game by giving the player stars for achieving goals by solving puzzle-games, which can be used to restore the fallen garden. When the player has enough stars he/she can choose from a list of ”To Dos” in the garden. This makes the player want to play more puzzle-games to be able to achieve all the things in the list. As things on the list are achieved, new things are added to the list, so the player always have a reason to continue collecting stars. Screenshot of the To Do-list. When the player starts to play Gardenscapes, he/she is introduced to the character Austin. Austin helps the player to progress in the game, and introduces new goals to be achieved, so the player is never left to alone figure out what is the next step. The puzzle-games are very similar to other 3 match-puzzle games, for example Candy Crush, and doesn’t need much explanation of what to do. If the player is not familiar with the concept, he/she can explore the different moves and objects available and will quickly learn the mechanics of the game. To make it more obvious and help the player if he/she is stuck, the objects blink and move to suggest the next move. There are many characters in Gardenscapes, which are introduced as the player gets to higher levels. Instructions and new challenges are given by the character of Austin, who speaks directly to the player. Austin also gives compliments and comments during the game as if he is talking to the player directly, which makes it feel more personal.